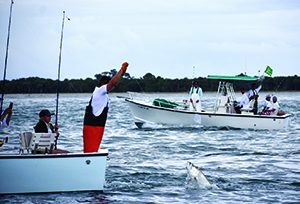 BY MARCY SHORTUSE – It was raining silver in Boca Grande Pass on Thursday and Friday, May 17 and 18, during the two-day 2018 World’s Richest Tarpon Tournament, according to Tournament Director Wesley Locke. The first day of fishing, though a bit stormy, brought the ‘poons out from hiding, and boy, they were chewing. There were 60 releases on the first day alone, and 53 during the second day for a total of 113. CAPT. WAYLON MILLS AND HIS TEAM ON BLAZE TOOK FIRST. When it was all over but the crying, Capt. Waylon Mills and his anglers – wife Angie Mills, aunt Sally Joiner, cousin Sam Joiner and uncle Cappy Joiner – left the awards stage with a check for $34,800, World’s Richest rings, trophies and more. This was the first time Cappy had fished the World’s Richest in many years, as he was usually out in the Pass during the tournament as a spectator. He brought one release to the boat on the second day of the tournament. The second-place team on Outta Line with Capt. Blake Cheske included anglers Bob Benton, Nancy Benton, Tracy Mills and Amber Mills. They took home a check for $23,200, plus trophies and more. The check for first tarpon of the first day, which was caught in the pouring rain, went to the team aboard Anejo with Capt. Tater Spinks. The prize for the last fish of the day went to the Casuarina team with Capt. Charlie Coleman. First fish of the second day went to Little Spook with Capt. Nelson Italiano, and last fish of the second day went to the team on Hey, Moma! with Capt. Wayne Joiner. Each first/last prize was $14,500. This was a record-breaking tournament, in a sense. While there have been more fish caught before, that was during a time when there was a full field of 60 boats. This year, with only 29 boats catching 113 fish, the radio traffic was nonstop and the tournament judges were hopping. Two new/old faces on committee (judge) boats were Julie Jean Robertson, whose father was one of the most popular captains in the Pass for many years, and Braxton Bowen. 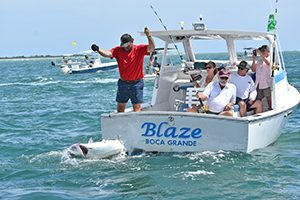 Rich Caccavale, Dixie Hollins, Ed and Austin Kopp and Sandy Bylaska were manning committee boats as well during the tournament. This World’s Richest win puts Waylon in a spot as a fierce contender for the coveted Jay Joiner Memorial Belt Buckle, the winner of which this year will be determined through four tournaments – Ladies Day, Ladies Howl at the Moon, World’s Richest and the Red Gill. It’s still anyone’s game, though, as it’s not how many tournaments the captains win … it’s how many fish their teams release in all four venues. That award will be announced at a party in July. The next tournament in the Pass will be the Gasparilla Island Kids Classic on Saturday, June 2. After that is the 10th annual Ladies Howl at the Moon Tarpon Tournament on Saturday, June 9. The Red Gill Invitational will take place on the following Saturday, June 16. 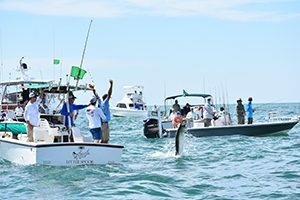 For more photos of the World’s Richest Tarpon Tournament, see pages 22, 23 and 24 of this edition and go to bocabeacon.smugmug.com and click on “Day One” and “Day Two” of the World’s Richest.